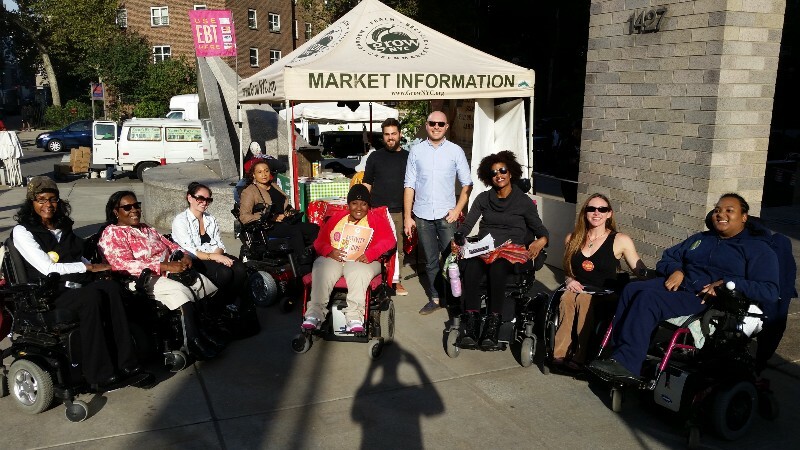 In October of last year, Women on Wheels was given a private tour of a local Greenmarket by a representative from GrowNYC. (http://www.grownyc.org/) In March, they celebrated their 40th anniversary and asked if we would write an article about our experience for use in their campaign. Women on Wheels, a peer support group at Mount Sinai, was started in 2014 in order to provide women with spinal cord injuries a network in which to share knowledge about their common and individual disability-related experiences. We aim to help our members lead informed and well-rounded lives and do this through weekly meetings, guest speakers and workshops centered around health and wellness, with specific focus on physical, nutritional, emotional and mental well being. With diet and general health often being major topics of discussion in our meetings, last fall we were excited to be afforded the unique opportunity of taking a guided tour through one of NYC’s Greenmarkets. When we arrived at the market, we were greeted by Rob from GrowNYC, who turned out to be our enthusiastic and extremely knowledgeable tour guide. He began the day by giving us fruit and vegetable buttons to wear, which immediately put us in the spirit of the farmers’ market. Rob then showed us a map, pointing out the various farm locations in upstate New York where many of the fruits and vegetables are grown before making their way down to NYC. Since most of us only knew of the larger markets like in Union Square, Rob provided us with a list of the numerous other locations throughout the five boroughs — 53 in total! With travel sometimes presenting an obstacle in NYC for those with mobility issues, learning of other neighboring markets was welcome news and greatly appreciated. Rob explained that the markets not only support the farming industry, but also greatly increase access to high quality, fresh and affordable produce for people in neighborhoods throughout the city. We also learned that to help in this effort, almost every Greenmarket location in Manhattan accepts EBT, or what’s commonly known as food stamps, providing everyone the opportunity to have access to healthy eating options. Throughout the day, we were introduced to the large assortment of fruits and vegetables that each market offers and found out that some locations even provide textile and rechargeable battery recycling, compost drop-off and information about wind energy alternatives. We were very pleased to see that the entire market was wheelchair accessible, with easy access between aisles and to each vendor. All produce was located on low shelves, tables and crates so that we were actually able to see and reach the wide variety of fruits and vegetables to choose from. During our tour, we received health tips such as the importance of reducing sugar intake in our foods and drinks, while learning about ways to still add flavor by infusing water with cucumber, melon, lemon or mint. We were also offered a variety of healthy and balanced recipes that could be created from the many seasonal products available at the market. At the end of our tour, we were given vouchers to use toward purchasing items that day or during a future visit. Many of us took advantage of this opportunity and even picked up a few items to have for dinner that night. The mustard greens were a big hit! This year, in continuing with our focus on healthy lifestyles and inspired by our Greenmarket tour, our members have been keeping food journals and recording their individual eating and exercise habits. In the month of April, we plan to share our journals with a nutritionist who will be speaking to the group and guiding us in making healthy and balanced food choices and reaching our individual health goals. We also plan to take another tour of the Greenmarket this spring, followed by a cooking workshop at Mount Sinai where we will use some of the fruits and vegetables purchased at the market in order to create a healthy meal. Overall, it was a fantastic experience and we’d like to give a big thanks to Rob at GrowNYC for providing us with valuable information and an exciting day!